If it looks like a diamond and sparkles like a diamond, it's a diamond - right? A natural faceted diamond, on the left, and a man-made faceted diamond on the right. These days it's not so easy to pick out a natural diamond from among the assortment of colorless, shiny stones on display at a jewellery counter. Man-made diamonds (also known as synthetic and lab-grown) and imitation gem materials may also have a spot among the natural diamonds mined around the world. It can be confusing to know what you are looking at and what best fits what you want in a piece of jewellery. Natural diamonds are one of nature's wonders. They can be several billions of years old, made of a single element (carbon), and are formed deep in the earth under extreme pressure and high temperature. These intense geological conditions produce the physical properties, transparency, optical appearance and hardness, valued in a cut and polished diamond. When it comes to a natural diamond, we are looking at something that is really a rarity and a treasure from Earth. But man-made diamonds have a place in the market as long as consumers know exactly what it is that they are buying. There are other synthetics out there, such as synthetic ruby, emerald and sapphire, so it's not something new for the jewellery industry to have a synthetic alternative. The jewellery industry uses special terms for manufactured and look-alike materials: man-made (synthetic, lab-grown or lab-created) and imitation (simulants). Man-made diamonds are grown in a laboratory or factory. Their growth structure and atomic level defects allowing them to be readily separated from natural diamonds by a well equipped laboratory such as GIA. Because natural diamonds and man-made diamonds have some of the same physical and other properties, even a skilled jeweller or trained gemologist cannot distinguish them by sight alone. It takes specialized equipment and trained staff in a gemological laboratory for a conclusive identification. 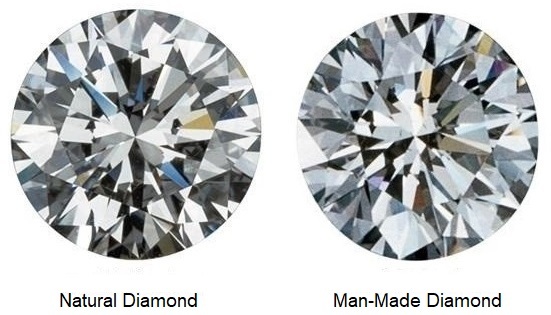 Diamond imitations only mimic the look of natural diamonds. 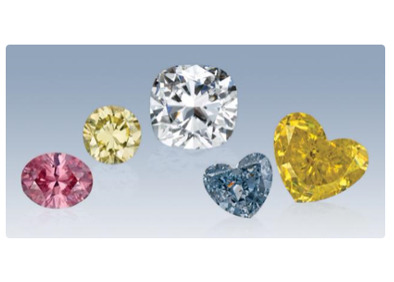 Common simulants include colorless sapphire, colorless zircon, synthetic cubic zirconia (zirconium oxide, CZ) and synthetic moissanite (silicon carbide). Cubic zirconia and synthetic moissanite are the most important in the market. They may be natural or made in a lab, but do not share the chemical composition or physical properties of natural or man-made diamonds. Because simulants do not share those properties with diamond, they are more easily distinguished by gemologists. Man-made diamonds are a more common topic of discussion at the jewellery counter these days because they are being used more frequently in jewellery. They may be an option for some jewellery buyers as long as they are correctly identified. It is important that you have extensive knowledge and information about man-made diamonds and know what questions to ask before you shop. Man-made diamonds are being used more frequently in jewellery. They may be an option for some jewellery buyers as long as they are correctly identified. It is important that you have extensive knowledge and information about man-made diamonds and know what questions to ask before you shop.